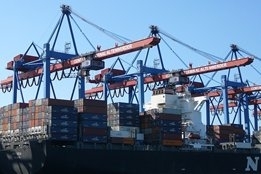 Drewry has added its voice to those who believe the upcoming IMO 2020 rule will spur more slow steaming among box shippers. The reason? Failure to recover costs through BAFs, the consultancy says. "Depending on their success in raising the fuel recovery rate, carriers will inevitably seek to mitigate the anticipated higher operating expenses. One potential side-effect from the new regulations could be greater slow-steaming and use of transhipment," Drewry said in its latest Container Insight Weekly. "The logic being that as ships sailing speed is reduced and round voyages are extended carriers will drop ports from rotations to ensure that transit times to key points remain competitive. Fewer direct port calls will induce greater need for transhipment and feeder operations." Adding weight to its view, Drewry says historically there is a reasonably high correlation between bunker prices and incidences of transhipment globally as a percentage of total port throughput. Such measures also seem likely, with Drewry saying many shippers are resigned to the fact they will have to pay more towards the fuel cost burden, while there was also a number of "sticking points" in respect the how the recovery mechanisms will work. Further complexity comes from the reality that in 2020 different carriers will use different fuels. Some will continue to burn cheaper HSFO by fitting scrubbers, some will opt for more expensive VLSFO, while others will go the most flexible albeit most expensive route and lift MGO. With availability of fuels also uncertain, for some carriers knowing what type of fuel will be burned may well not be known until very close to the point that they are lifted. While this all adds to scepticism over carriers' BAFs, Drewry warns against the risks of too much pushback. "Shippers rightfully want more transparency regarding how the new fuel surcharge mechanisms will work, but they should be mindful of the potential risks to future service options, competition and rates if they don't concede anything to carriers," it said. Intertek opens laboratory in the port of Khor Al Zubair.